The Center for Prostate Disease Research (CPDR) at the Uniformed Services University of the Health Sciences (USUHS) and the Walter Reed Army Medical Center (WRAMC) hosts lecture series called “CPDR Saturday”, which has been in existence for over 10 years. CPDR Saturday speakers represent leaders in prostate cancer field. Presentation Title: "Novel ERG-function Based Therapeutic Approaches to Prostate Cancer." Dr. Shyam Reddy is an internationally known cancer researcher who has discovered and studied nearly 20 cancer genes. The most notable genes discovered by Dr. Reddy include ETS-related gene ﻿(ERG)-1, ERG-2, ERG-3, and human FLI-1 genes﻿. ERG has been shown to be involved in the majority of prostate cancers. It is also involved in Ewing sarcoma and acute myeloid leukemia. Dr. Reddy's laboratory is currently targeting these oncoproteins for their functions in order to develop new targeted therapeutic agents. 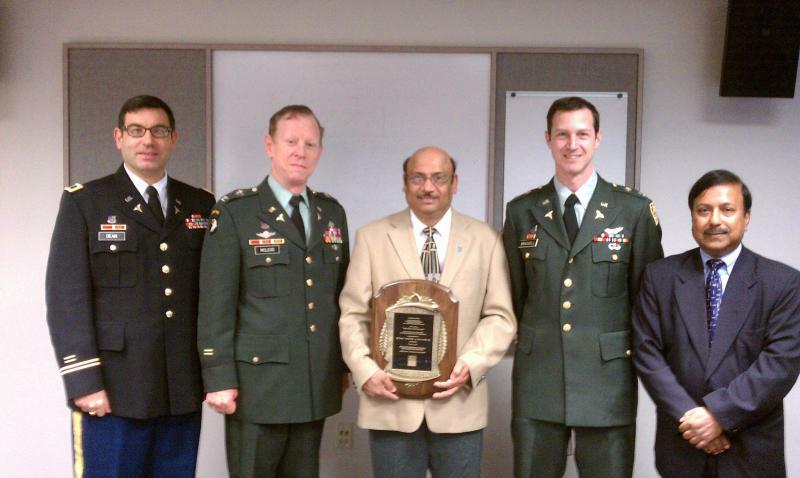 Dr. Reddy received his PhD from the Center for Cellular and Molecular Biology in Hyderabad, India. He published back-to-back papers in Nature and won the National Young Scientist Award for his graduate research. He received post-doctoral training at Yale University in New Haven, CT. Dr. Reddy's professional affiliations include staff scientist at the National Cancer Institute at the Frederick, MD branch; assistant professor at the Wistar Institute and Thomas Jefferson University, both in Philadelphia, PA; and professor and director of the Division of Cancer Genetics at MCP Hahnemann University at Drexel University in Philadelphia. Dr. Reddy has received many honors and awards for his pioneering research. His work has been published in several prestigious journals and supported by grants from the National Institutes of Health, the American Chemical Society, and the Department of Defense. Left to Right: Dr Robert Dean, Dr David McLeod, Dr E. Shyam P Reddy, Dr Stephen Brassell, Dr Shiv Srivastava. Dr Reddy received CPDR Recognition Award for Distinguished CPDR Visiting Professor lecture from Dr David McLeod, CPDR Director.